Price control is price dictatorship. Or one form of product coercion, or industry over-regulation. There are many factors why the price of a particular commodity or service is deemed “expensive” and “inaccessible”, especially to the poor. Foremost of which are (a) cost of production, including the cost of innovation and R&D, (b) cost of marketing and promotion, (c) cost of transportation, storage, distribution and retailing, (d) cost of taxes and regulatory fees by governments (national and local), (e) mark-up by producers and traders, depending on the extent of competition among suppliers and producers. Absence of any competition (monopoly) or just limited competition (oligopoly) means bigger mark-up. Very often, government regulations directly or indirectly, determine the extent of competition or lack of it, in a particular industry or sector. Government franchising, for instance, creates monopolies. An electric cooperative, or a cable tv operator in a particular province or region, or tricycle route in a particular village or municipality, are given monopoly franchise by certain government agencies. The drug price control policy is now five and a half (5 ½) months old since its implementation last August 15, 2009. There has been no serious study or assessment made by the implementing agency, the Department of Health (DOH) yet, on whether the policy has attained its primary objective – to make branded, popular and highly saleable medicines produced by multinational pharmaceutical companies, become more affordable and more accessible to the poor. 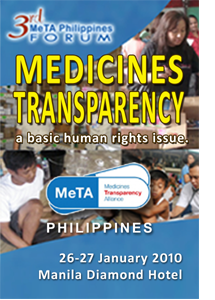 On the proposed round 2 of drug price control by the DOH reported in the news story above, the occasion was during the 3rd Medicines Transparency Alliance (MeTA) Philippines Forum this week, January 26-27. I have attended the 2-days forum held at Diamond Hotel in Manila. Drug price control, aka maximum retail price (MRP), was extensively discussed in the morning session of day 2, last January 27. The five speakers in that panel were leaders from the Cancer Warriors Foundation (CWF), Health Action Information Network (HAIN), Philippine Chamber of Pharmaceutical Industry (PCPI, the alliance of local pharma companies), the European Commission Technical Assistance - Health Sector Policy Support Program (ECTA-HSPSP), and Philippine Health Insurance Corporation (PhilHealth). Drug price control is explicitly supported by the CWF leader, was deemed “important but not enough” by the leaders of HAIN and ECTA, was shot down by the PCPI leader, while the PhilHealth official has some preliminary but incomplete assessment of the policy yet. Succeeding discussions during the open forum showed that the price control policy rests on a hollow base. A speaker from a medium-size drugstore chain, for instance, said that contrary to expectations that the volume of branded medicines by multinational pharmaceutical companies that were hit by the policy will increase, the lady said that their sales of such medicines even suffered a decline of 3 percent from mid-August 2009 to late January 2010. And why is this so? It is because those who used to buy the affected drugs did not increase their purchase of said products. If they were taking one tablet per day, a 50 percent mandatory price cut did not cause them to buy two tablets per day. They just saved money. Meanwhile, the poor still found the 50 percent price cut not enough. Take amlodipine (most popular, branded drug is “Norvasc” made by Pfizer). Before the MRP, it was sold at Php44 per tablet. But the cheapest generic amlodipine, same dosage, was already selling at Php8 per tablet. So even at coercively reduced price of Php22 per tablet, it is still expensive for those who get another drug for the same disease at only Php8, or even Php11 per tablet. In short, MRP benefited the rich and middle class, not the poor, who are the main target beneficiaries of the policy. Competition among pharma companies in the country made sure that poorer households and patients would have some alternative drugs at a lot cheaper price compared to branded and patented drugs. Besides, pharma industry leaders (both multinational and local) who spoke during the forum, pointed out that some small, local generic manufacturers whose drug prices are only about 70 percent lower than the branded products prior to MRP, suffered erosion of their market share as some of their customers shifted to the branded drugs that experienced mandatory price cut of 50 percent. An official of another medium-size drugstore chain that I talked to said that their sales showed some increase in the volume of the branded drugs by multinational companies that were hit by MRP. Thus, local generic manufacturers were also badly hit by the policy. All drugstore managers (both chain stores and independent small ones) that I talked to during the forum said their sales as drugstores were badly hit too. Since they were advised by the DOH to keep their percentage mark-up, say 10 percent, before and after the MRP, their profit was affected. At 10 percent mark-up, they make Php5.00 gross profit from a drug selling at P50. When that drug’s price was forced by the government to be sold at only Php25, now they make only Php2.50 gross profit. And since drugstores are also forced by two laws to give mandatory 20 percent discount to (a) senior citizens and (b) persons with disabilities, the small mark-up they make from average customers can be wiped out by the mandatory 20 percent discount that the government mandated that drugstores alone should shoulder. The uncontrolled passion for price control may be understandable if the intended target beneficiaries indeed benefit. But if it did not, such uncontrolled passion is no longer guided by the logic of economics and healthcare for the many. It is simply guided by politics and the deep desire for strong power to regulate other people’s lives and business. 1. What, in your view, have been the top three impediments to rapid and broad-based (inclusive) growth in the Philippines? 2. If you were the President, what top three concrete measures (i.e., strategic measures which you believe that once achieved, would lead other issues to fall into place) would you implement to achieve rapid and broad-based (inclusive) growth for the Philippines? I emailed back my answers to him. Then just curious, I posted yesterday morning in my facebook status to see some friends' comments. See those comments below. A consultant of ADB asked, What's the top impediment to rapid growth in the Philippines? My answer: Lots of laws but no rule of law. Laws and prohibitions (no stealing, no killing, stop on red light, etc.) apply only to ordinary people but those in govt, especially the top leaders, are exempted from the law. Thanks. Half-implementation of the rule of law means govt. leaders can steal, can change rules and create new prohibitions arbitrarily, discouraging investments and job creation. you hit the bull's eye, noy! korek ka jan pareng noy!! happy valentines!! Rule of law is a radical idea. No one is exempted from the law, no one can grant exemption from the law, and the law applies equally to unequal people. One implication is that the number of laws should be as few as possible. So, candidates who authored plenty of laws are dangerous. The ADB Know it themselves. The top impediment to rapid growth is red tape and corruption. Probably even in that order. Yes, the ADB knows about the corruption and robbery, the absence of rule of law in the administration of public finance, happening in the countries they're lending to incl. the Phils., but generally keeps silent about it and just keeps lending. The “3rd MeTA Forum” is on-going, January 26-27, at Diamond Hotel, Manila. It is sponsored by the MeTA Philippines. I attended day 1 yesterday, and the topics were some updates on what MeTA International and MeTA Philippines have achieved so far in making medicines become more accessible to the poor. Other topics were procurement of essential medicines by the public sector (DOH-affiliated hospitals, local government units), and financing of such medicines. There is a long and expanded discussion on medicines, their high prices compared to some Asian countries, the shenanigans in public procurement of medicines, other curative aspects of healthcare. Buried or not even mentioned in the discussions, is the preventive aspect of healthcare. When people live in dirty places, say under a bridge or a creek with stagnant water, or shrubby areas that attract mosquitoes and various insects, people there, especially children, will be susceptible to various types of diseases. Or when people don’t observe proper hygiene like washing their hands well before eating. Or when people over-drink, over-smoke, over-eat fatty food, and so on. So when people become sickly, the eyes of the public and political leaders are on medicines and the pharmaceutical companies that produce medicines. Anyway, this is a forum by an organization with explicit and categorical mission to make access to quality medicines be easier to the poor. So we stick to the subject. What I find rather strange, if not hypocritical, is the continued insistence that various government units, national and local, should be in the business of medicine procurement and distribution to the poor. Last year in the 2nd MeTA Forum, there was a speaker from WB-Manila who documented instances of many drug warehouses by some big LGUs in the country – where rats, cockroaches, dust and garbage mix up in one room with useful drugs and expired drugs, and the room has no temperature control. In this case, even if we assume that there was no corruption and robbery in drug procurement, the big problem is the quality and efficacy of those medicines that LGUs will distribute to the public. Yesterday, there was a session where speakers noted that drug procurement prices by government units are several times higher than those in a number of Asian countries. Which point to either, (a) certain government personnel are bloating their procurement amount so they can pocket and steal more money, or (b) pharma companies here, especially the multinationals, tend to price their products a lot higher in the Philippines than in other Asian countries. Or both happened. If the main explanation is (a) above, then it’s one clear case of government failure, happening persistently. Then there should be some persecution of guilty parties in order to send a strong signal to other government personnel that stealing is heavily penalized, not forgotten. Then corruption in public procurement will be drastically reduced, if not controlled. If the main explanation is (b) above, then it’s one clear case of the lack of competition among pharma companies, foreign and local. One policy implication is to encourage the entry of more players, both foreign and local, both manufacturers and traders (wholesalers, retailers). Sadly, public policy actions in either (a) or (b) are not being done. Public procurement continues, foreign loans by the WB and other foreign aid institutions continue, poor health outcomes in the public continue, and endless taxation to pay for ever-rising expenditures and public debts on drug procurement and related healthcare items, continue. So what is the result, the state of public health, especially the poor people, remains generally unchanged while public debts and taxes keep rising? A presentation by Dr. Delen dela Paz of Health Action Information Network (HAIN) and also a faculty member at the UP College of Medicine, she mentioned one result of the HAIN medicines survey in 2009: essential generic drugs' prices in public drugstores are about 1/3 than prices in private drugstores. So many poor people go to government-run or sponsored "botika". Problem is that availability of such cheap drugs were only 31% in public outlets vs. 61% availability in private drugstores. So, the hard lesson: cheap, yes, but less or not available. Which is better: more expensive but available vs cheap but not available? If one is very sick, then price becomes a secondary issue compared to availability of a product that can make him/her well. And this is one long-term effect of drug price control that advocates of the measure, including those in the government, seem not to realize: more effective drugs, more disease-killer medications, will theoretically be sold "cheaper" in the Philippines. But their availability is zero. Manufacturers and sellers of those drugs will sell such products in Singapore or Hong Kong or Japan or other Asian countries which have no drug price control policy, and not bring such products in countries where a price control is being implemented, or pulled out but can be re-implemented anytime, depending not on any health emergency, but on certain political emergencies of the big politicians and the administration in power. So desperate patients will be forced to purchase such drugs abroad, at a more expensive price because of the cost of shipping and storage. This is related to "irrational drug use" issue. People are buying medicines and vitamins even with little or no proven therapeutic effect simply because such drugs are cheap, or are heavily advertised (broadcast media, outdoor billboards, etc.). One big local pharma company is the heaviest spender on drug advertising in the country. There's a good article in The Economist this week, "The growth of the state: Leviathan stirs again". This is chart 1 of the article, showing that big governments are getting bigger, especially UK and the US. http://www.economist.com/displayStory.cfm?story_id=15328727&source=hptextfeature. Notice how total government spending were more than 50 percent of GDP in UK and France. While in the US, it has now reached 40 percent of GDP. I think the figures there are total for both national/federal and local government units (state, province, county, city, etc.). Another chart projects the growth of US federal government alone. It is projected to grow to more than 40 percent of GDP by 2040. If spending by local governments are to be iincluded, which by themselves are also growing, then US total government spending should be similar to that currently in UK and France. "Interest groups spend hugely to try to affect political decisions: there are 1,800 registered lobbyists in the European Union, 5,000 in Canada and no fewer than 15,000 in America. Mr Bush’s energy bill was so influenced by lobbyists that John McCain dubbed it the “No Lobbyist Left Behind” act." I highly recommend this article to my friends. It should be one consideration for them when they decide whom to vote in the coming national and local elections in the Philippines this coming May. This is one face of fiscal irresponsibility, of persistent budget deficit (expenditures larger than revenues). For the past 29 years, except for a few years during the (ironically) Democrat leadership of former Pres. Bill Clinton, the federal government has been on deficit, stretching to even bigger deficit in the next 10 years, as projected by the CBO. And note: this is federal deficit alone. Various local governments -- states, counties and cities -- also have their own set of deficit and rising public debt. Fiscal deficit and irresponsibility. They are similar. Current over-spending and over-borrowing administrations will not be around anyway when it's time to pay off those huge debts. There are lots of noise to emphasize “academic credentials”, “legislative track record”, and related concerns in choosing the next President of the country in the coming May 2010 elections. Those making such noise are more often than not, rooting for the candidate of the administration party. A UP law graduate, bar topnotcher, has Master of Laws from Harvard Law School, been a defense secretary, etc. So what with all those Harvard degree/s? Gloria Magtatagal Arroyo also went to the US for her university studies where former US President Bill Clinton was her former classmate. And Gloria has a PhD Economics from UPSE. Good academic performance, "efficiency and political experience" will kill you if the person has no integrity, like Gloria, like Marcos. Any presidential candidate who talks about good governance but is silent about the corruption and dishonesty in the current government, has little integrity in the first place. Even if he has double masters and triple PhD somewhere. About "legislative track record", my bias is: those who introduced the least number of new laws for more government intervention and regulation is the better candidate. The Liberal Party’s (LP) presidential candidate is keeping the liberal spirit. No price control, no IPR confiscation, no govt. auditing of private corporations in a particular industry, etc. That's great. See news report below. LP's Presidential candidate is keeping the liberal spirit, while its VP candidate is moving away from it and embraced some populist-socialist policies. The two are united mainly on anti-corruption crusade. MANILA, Philippines – Wooing the nod of the business community, Liberal Party standard-bearer Sen. Benigno “Noynoy” Aquino III today vowed to provide businessmen a “level playing field” free of cronyism once he is elected as President in the May 2010 elections. Speaking before members of the Makati Business Club (MBC) during the organization’ s inaugural “Presidential Candidate Series” forum, Aquino said if elected, his administration would not interfere with companies in carrying out their daily businesses. IF you are all for nature conservation and renewable energy, you cannot have them for free. You have to pay. The government will soon establish the rates that will be added to your power bills. Should energy prices rise because of supply-demand dynamics, so be it. For instance, the number of cars, buses, boats, tractors, malls, subdivisions, condo buildings, schools, etc. have doubled and the volume of energy demand has also doubled while supply can only increase by 25%, then prices will have to increase. Fine. It's a different thing, however, when energy prices are rising because people are coerced and arm-twisted to subsidize more expensive energy sources even if cheaper, conventional energy sources are still available. 6. other national climate bureaucracies? Then such national climate bureaucracies are replicated at the local level, with several provincial, city and municipal task forces or offices on climate change. Then there are the expensive global meetings, national meetings, to "fight global warming and climate change", funded by who else, taxpayers' money. The source of all those climate alarmism is the UN IPCC. Plus Al Gore, plus big international environmentalist groups like the World Wildlife Fund (WWF), Greenpeace, Oxfam and Friends of the Earth, plus Haribon, IBON, etc. A friend commented that the man-made warming claim is part of the “free market of ideas”. Wrong. The UN IPCC, Al Gore, Pachauri, etc. say there is no such thing. They have declared several times, "Debate is over. Science is settled. There is preponderance of evidence. It is man-made warming, you all shut up, listen to what we say on how to mitigate warming." That's not free market of ideas. That's dictatorship, plain and simple. And the best way to do such ecological central planning is through the UN and the various national governments. On the “vanishing Himalayan Glacier" scandal, here's a brief background. In 2007, IPCC produced a report saying something like "Himalayan glacier will be gone by 2035 if not sooner, if current warming will continue." The source of that report was the WWF 2005 report. Which WWF got from a 1999 article from the New Scientist journal. Which the NS reporter got from a phone conversation with a less-known Indian scientist, Syed Hasnain. Who later admitted that the claim was “speculation” and was not supported by any formal research. While searching for materials on drug price control policy in google, I saw this entry in the LP website, "Roxas: where's the second list?" The article was referring to the Senator's desire to see a second list or second round of drugs to be issued price control. The first list of drugs (21 molecules, nearly 100 drug preparations) was issued in late July 2009. Implementation of drug price control policy was August 15, 2009. Drug price control, along with IPR-confiscation policies like compulsory licensing (CL), are examples of health socialism. Price control policy says, "We don't care how excellent and revolutionary your products are. Their price should not be far from the price of the most mediocre products around. Their price should be socialized." CL policy says, "We non-innovator companies declare upon you innovator companies: the high cost of your R&D and innovation, the losses in your failed researches and unsuccessful products marketed, are yours and yours alone. But your successful and highly saleable invention is also OUR invention." That's socialism, plain and simple. December 29, 2009 (25 pages, 17 short essays). October 15, 2009 (33 pages incl tables and annexes), presented in a conference in Singapore last October. It is dangerous to mix liberalism with socialism. Liberalism in its literal meaning, is to liberate, to free, to remove or limit coercion. Socialism in its literal meaning, is to socialize, to collectivize, by force and coercion. It is unfortunate, therefore, that a key leader of a Liberal Party that is supposed to advance liberal politics and liberal economic policies, is advocating some populist and socialist policies. I just got a long comment from a reader, Terry Daly, in Part 1 of this discussion, posted last January 4, 2009. You confuse 'democratism' with 'democracy'. Fatal error. As you say in your essay, 'democracy' is always prefaced by the words 'liberal', 'social', 'Christian', 'Moslem' et al. There is one major consequence to this. These ideologies and theologies always take precedence over 'democracy'. The 'democracy' element consists merely in individual citizens having one vote every five years - to elect a dictatorship (liberalist, socialist, Islamist, Christian et al), which is then at 'liberty' to act in blatant defiance of the will and wishes of the democratic majority in each and every piece of legislation it enacts and in each and every action it undertakes. Impressed? I'm not. Take the present Obama health care legislation being rushed through the US Senate. All the polls show that the majority of the American people are against it. It's still being forced through. Take fundamental UN 'climate change' legislation. All the polls show the democratic majority of the people in America, Europe and many other places don't think such legislation is necessary. It's still being forced through. I could go on. Now let me define 'democratism' for you. It's the will and rule of the democratic majority in all things at all times in every institution in every country. That's democratism. It hasn't happened yet. We're in the pre-democratism age. Democratism as defined here, I'm sure you'll agree, bears no meaningful relationship to 'liberal democracy' or 'social democracy' or 'Islamic democracy' or 'Christian democracy'. These latter are all liberal, social, Islamic or Christian dictatorships, nothing more, nothing less. I'm a democratist. I suggest you embrace democratism in place of your present classical liberalism. Classical liberalism has long ago lost the battle to social liberalism. Even if it hadn't lost the battle, classical liberalism in its heyday was never anything more than elective dictatorship - the antithesis of democratism - and therefore no different to contemporary social liberalism diktat and dictatorship. Democratism as I have defined it here is a living, dynamic organism that gives each individual citizen a vote and a debate on everything, continuously, not merely once every five years to choose a dictatorship. Modern technology and the internet make all this possible. Everywhere. Get ready. 2010 is about to witness the birth of democratism in Britain, America, Canada, Australia, Europe and elsewhere. From the bottom up. There is one very important concept in my earlier essay that Terry failed to notice or failed to discuss: coercion. The use or non-use of coercion separates the philosophies among liberalism, democratism, authoritarianism, and other ideologies. In a society of no coercion to materialize such vision, each able-bodied and able-minded person should have a job and/or sufficient savings. Other people will have extra resources to take care of people with special needs, like people with physical and mental problems (the blind, authestic, paralyzed, etc.) and with special health needs. In a society of institutionalized coercion, even the lazy and irresponsible who are very articulate and influential in political lobbying, will eat and be entitled to certain social and economic subsidies, courtesy of governments (democratic, authoritarian, etc.). Governments do this via high and multiple taxation, then redistribute the tax revenues from the industrious to the less-industrious and the various bureaucracies in government agencies that will implement the multiple tax collection and monitoring, agencies that will implement the distribution of subsidies and perks. Democracy is Not majority rule. Democracy is the recognition and respect of dissent; democracy is appreciation of the rule of law; democracy is protection of minority opinion as the individual is the smallest minority; democracy is recognition of individual rights and property rights. This “rule of the majority” is what can be dangerous. As Barun argued, the smallest minority is the individual. If the majority is affiliated with a particular religion and one or two person/s believe in another religion, then religious persecution is possible to implement the will and rule of the majority. Is a society of zero or little coercion possible? Definitely. We are actually seeing and experiencing it everyday. When we go out to buy food outside, thousands of food vendors, food shops, food manufacturers and distributors, are competing with each other to get our attention, to get our patronage and support. There is zero external coercion involve when we choose milk C over milk A, B, D, E, F, etc. This society is the free market out there. Those who fail to get enough consumer attention and support will later be forced to close shop, and/or be forced to move to another industry or sub-industry and try their luck in attracting customers and clients there. So a vote for classical liberalism and individual liberty is a vote for a society of less government intervention, less government regulation and taxation, and a society of more personal and parental responsibility. Authoritarianism need not be practiced by a political minority, say a dictatorship with a big army and big police. Authoritarianism can also be practiced by the majority, by enacting into laws certain public policy measures that subsidize and favor certain sectors in society, while over-taxing and over-regulating other sectors of society. I agree with Barun that democracy should be taken wholistically. Both economic and politicial democracy. But as I argued earlier, democracy per se, is not the problem or the solution. It's the coercion, state coercion using the laws, law enforcement agencies (police, armed forces, prison system), the legal system (courts and appeal courts), that makes whatever economic and political system potentially dangerous to the individual. Most or all people will agree to the statement, "everyone should eat properly and have decent life." If there was no state coercion involved, then it is assumed that everyone, the able-bodied and able-minded people, should work, so they will have money and resources to eat and live a decent life for their family and community. But ever since coercion was invented as a necessary part of government, certain sectors of society have mastered the art of political lobbying, not real working, as a way to feed themselves, their family, and other sectors. First there is a big group of people who produce not a single kilo of food or transport a single person to do a service for a fee; these are the people who have become full time regulators and government administrators all their lives. Second, there is another big group of people who rely on welfare and transfers. They may have zero work or work very little, but the entitlement system in society allows them to eat and have regular form of allowance and health insurance. The US is the biggest democracy (or 2nd biggest, next to India?) in the world. Yet we hear many voices complaining that too much entitlement, expensive welfare system, all enabled by coercion in a democracy, is dragging the US economy and leaving a huge dent on the democractic process. In a free market outside of government regulations and restrictions, there is full democracy without coercion. People patronize a particular food shop or barber shop or clothes and shoes shop, while ignoring the other shops. This forces the ignored ones to further improve their services or bring down their prices to attract more buyers. So full democracy without or minimal coercion is possible. In government system, there may be full democracy (still subject to debate) but there is always coercion involved. And this makes the essence of government democracy questionable in the first place. Anyway, just pondering on that nagging issue why I think it is coercion, not democracy or other forms of government structures and policies, that should concern us. Of course I am not saying that it is possible to banish coercion from the face of the earth. There WILL always be coercion, happening in our daily lives, mostly done at the micro and household level. For instance, if our kids will not stop watching tv and they don't do their school assignment or will not go to bed early, we use our authority as parents or guardians to coerce those kids to stop watching tv all night. That's micro level of coercion. So as Hayek said, coercion is a matter of degree. Some coercion are at the household level, some at the societal level. Some government coercion are useful and necessary, like the law against killing and murder, law against stealing and kidnapping, law against counterfeit and substandard medicines, law against adulterated and expired food and drinks, law against air and water pollution, and so on. They are deemed useful because they are meant to protect the citizens' right to life, right to private property, right to liberty and dignity. It is those new set of coercion and social entitlement that has become problematic for social thinkers. Earthquakes, volcanic eruptions, and other natural geological and meteorological phenomena will be with us. They are part of nature, part of the dynamism of the planet. What we humans can do is to adapt to them as it is impossible to “conquer” them. And in the first two weeks of this year, 8 earthquakes with intensity 2.1 to 5.3 already occurred in the Philippines, http://earthquake.phivolcs.dost.gov.ph/update_SOEPD/EQLatest.html. The intensity 7.0 earthquake that hit Haiti was indeed terrible. Estimates of the casualty are still wide, between 50,000 to 500,000. Even the low-end figure is still terrible. Maybe Haitians are not so prepared with earthquakes compared to Filipinos, Indonesians, Japanese, and others living on both sides of the Pacific Ocean. In the Philippines for instance, all medium to high-rise buildings consider the occurrence of a strong earthquake to hit the country anytime. The Earth is a dynamic planet. Below the surface (mantle, core, etc. ), perhaps hundreds of earthquake belts are moving everyday. And there are volcanic formations somewhere, especially under the ocean, like the Pacific ocean. In the Philippines, we have 200+ volcanoes, about 21 are "active", meaning they've exploded over the past 600 years. Where there is an active volcano, there is an active earthquake belt below or near it. On "Tens of thousands feared dead" in Haiti, Dr. Donald Boudreaux, Professor of Economics, George Mason University in Fairfax, Virginia, made this observation: “The ultimate tragedy in Haiti isn't the earthquake; it's that country's lack of economic freedom. The earthquake simply but catastrophically revealed the inhuman consequences of this fact. “Registering 7.0 on the Richter scale, the Haitian earthquake killed tens of thousands of people. But the quake that hit California's Bay Area in 1989 was also of magnitude 7.0. It, though, killed only 63 people. Indeed, economic freedom is the best defense against strong earthquakes, volcanic eruptions, global cooling or warming, etc. The strongest earthquake to hit the Philippines happened in July 1990. It was intensity 7.8, much stronger than that in Haiti. It was so strong, covered about 20,000 sq. kms., created a 125-km long rapture, and affected many cities and provinces north of Manila like Cabanatuan, Dagupan, and Baguio cities. Despite such a strong earthquake, only 1,620 Filipinos died. Not tens of thousands as projected in Haiti. This is not to say that the Philippines has high economic freedom compared to most countries. In the Economic Freedom of the World (EFW) 2009 report, the Philippines ranked #69 out of 141 countries surveyed, Haiti was no. 87, in between India 86th, and Turkey 88th, http://www.freetheworld.com/2009/reports/world/EFW2009_ch1.pdf. What makes the Filipinos more adapted and more prepared to earthquakes with intensity 7.0 or stronger, is that such tremble is always in the minds of people when they construct a building or a house. We have experienced magnitude 7.8 just 20 years ago, so all building developers assume that such magnitude can occur anytime. So they are building structures that can withstand intensity 8.0 or stronger. Politicians and governments can say, "We don't regulate earthquakes, and we help earthquake victims". Right. But if politicians and governments do not confiscate 1/4, 1/3 or 1/2 of people's monthly income in the form of mandatory and confiscatory income taxes, people would have more money to build stronger houses and stronger buildings. They can say, "Let intensity 7.0 earthquakes or stronger come in. Our building can withstand them.” The people's freedom to build stronger houses and buildings is crippled by one tax alone, income tax. And there are dozens of other taxes and fees that citizens have to contend with, depending on which country they live and work. And it should be pointed also, that the bulk of voluntary assistance to get to earthquake victims or tsunami victims are from private individuals, private corporations and groups. Earthquakes, both natural and political, are generally destructive. It is important that individuals should assert their economic and individual freedom against heavy politics and political intervention and taxation in their lives, so that they can adapt better to natural earthquakes. I got this from an email of a friend last October 2009. The Radio-frequency identification (RFID) issue has become hot again in the local media because of the highly suspicious and anomalous circumstances surrounding the scheme, the implementors, the company and other political actors involved. Big government always look for big racket. Noong 2007, ang kontrata ng STRADCOM sa computerization ng LTO ay nagtapos na. Subalit dahil nakasaad sa kontrata na "HAWAK NILA SA LEEG" ang LTO, dahil sa pagtatapos ng kanilang kontrata ay dadalhin nila ang mga computer hardware at software, at ang ititira ay ang DATA lamang, nanatili ang STRADCOM sa LTO. Patuloy sa paninigil ng COMPUTER FEE kahit na ang DATA ng bawat sasakyan ay naka-encode na at wala ng dapat pang i-build up o i-data entry. Patuloy ang pagkulekta ng STRADCOM ng bayad, dahil walang kumukwestiyon, sa ilalim ng ilong ng mga motorista. Sa kabila nito, ang pamunuan ng DOTC at ng LTO ay humingi ng mas malaking "PARTE", ibig sabihin, patong, lagay, kickback, etc, dahil nga naman, tubong lugaw na ang STRADCOM dahil dapat tanggal na nga sila. Syempre pa, medyo nagpakipot ang pamunuan ng STRADCOM at nagmungkahi na magdagdag na lang ng mga singilin sa motorista dahil anila, mga bobo naman at hindi aangal. Kung may aangal man, kokonti lang dahil gaano na lang ba ang sisingilin eh minsanan lang naman ang bayaran isang taon. At anila, may pera ang mga motorista dahil naka-sasakyan nga. Dito na ipinatawag ng STRADCOM ang kanilang mga "money making" thinktank upang umisip ng mga paraan kung paano pa makaka-kolekta ng dagdag kita upang lalo pa silang magkamal ng salapi. Unang pinalusot ay ang tinatawag na INTER-CONNECTION FEE daw. ito ay karagdagang P70.00 pesos kapag ikaw ay nagpa-smoke belching test. Napansin ba ninyo, bukod sa P350.00, eh may naka staple pang resibo na P70.00? Me narinig ba kayong angal? me umapila ba? wala di ba. e ano nga ba yung P70.00 peso eh naka Honda CITY ka naman. chicken feed!!! YUN ANG BASIS NG STRADCOM, walang aangal dahil barya lang ang sinisingil nila. Naunawaan nyo ba kung ano yung inter-connection fee? Malay mo nga naman diba, nadale na kayo dun pero okay lang kayo kasi nga P70.00 lang. Teka, 8 million registered vehicle X 70.00 = 560 million pesos na walang kahirap hirap. KADA TAON HA. Malaki din pala nadudugas namin sa inyo. Aangal na ba kayo? Pero dahil mga buwaya nga, talagang walang kabusugan. Kaya pinulong ulit ng mga hunghang ang mga evil brains para utusan na, "Pigain na natin ng husto ang mga bobong motorista, bayad naman ng bayad eh". At dito na ipinanganak ang unang plano na "Car info sticker" kung saan didikitan ng sticker ang mga sasakyan, nakalagay dito ang mga detalye na makikita din naman sa "Certificate of Registration" o "CR", at sisingilin nila ng P300.00 yung sticker. Di syempre sangkatutak na angal ang inabot nila. Napigilan ito, hindi napatupad. Bulilyaso! eh kasi nga walang bahid High Tech. Mantakin mo nga naman na sticker lang tapos ang impormasyon eh nasa CR na din, hindi umubra. Ipa-photocopy (reduced) na lang yung CR at idikit sa windshield, sabi ng mga pilosopo kaya na-abort yung evil plan number 1. Pero hindi agad susuko ang evil brains ng STRADCOM, kailangang magmadali dahil dapat magkapera at ma-implement ng October. Na browse sa internet ng mga IT gurus ang tungkol sa RFID, at iminungkahi agad kahit na hindi pang vehicle talaga. Napagkasunduang, pwede, at inaprubahan agad. Ang siste, ang lalamanin lang ding impormasyon nito ay kung ano ang nakalagay sa CR, pero, may bahid high tech na, kasi R.F.I.D. na. Naintindihan nyo ba ibig sabihin ng RFID? Basahin nyo na lang sa last part. 1. sa simpleng paliwanag, parang tag lang ito, barcode or product code. na ang corresponding data or information ay mare-retrieve mo sa main computer gamit ang isang reader or scanner. 2. o kung ito ay may microchip, pwedeng mag store ng data dito at marere-trieve din ang data gamit ang isang reader. 3. at ang pinaka delikado sa lahat, na maaring gamitin laban sa mga motorista, PWEDE KANG I-TRACK ng ahensiya. RFID ang gamit sa mga producto sa mga dept stores na medyo mahal ang item at RFID din ang gamit sa mga cargo ng freight services. Pero may pakinabang ba talaga tayo sa RFID kung ito ay gagamitin sa mga sasakyan? WALA. ang tunay na gamit ng RFID ay para sa PRODUCT TAGGING, INVENTORY, AT TRACKING. Sa mga producto para ma-track mo kung nasaan na yung location dahil kada daan nito sa isang area, nababasa ng reader ang RFID at alam na dumaan na ito. Maaaring naglalaman din ito ng info kung sino ang manufacturer, kung ano ang laman, timbang at kung saan ang destinasyon, dahil nakalagay na ito sa RFID o sa main database. Alam ninyo, may malaking blunder ang kompanya namin dito eh, ang STRADCOM, dahil nag-implement kami ng information via TEXT lang kung saan ite-text nyo lang ang plate number, makukuha na information ng isang vehicle. Eh, imomodify lang namin yung info na binibigay ng TEXT project namin, at bigyan exclusivity sa mga enforcers lang ng LTO, nagawa na agad ang gustong gawin ng RFID System. Di ko na nga lang masikmura ang kagarapalan ng mga amo namin na sobrang magpayaman samantalang kami ang tumatrabaho eh nangungupahan pa din kami ng bahay. Anak ng toklang, ibuking ko na lang di ba. Eto itanong ninyo sa STRADCOM para mabuliyaso sila. Bakit kelangan ng i-implement ngayong October? 1-kasi pinipiga sila ng isang mataas na opisyal ng LTO na tatakbo sa darating na halalan. 2-Kasi kung mapalusot nila ng October, tahimik ang november at December, pag dating ng January parang may basbas na dahil nga nasimulan na ng October. at dapat mag start na ngayong October, kasi pag sa January mag start, titirahin ng mga pulitiko, at baka tamaan pa ng ban. Pag naka RFID ba, di na kelangan magpa stencil at magpa smoke belching pag magpapa rehistro? Kelangan pa din. Ano yung sinasabi nilang mapapabilis na rehistro? For your info walang mase-save na time sa pagpapa-rehistro ninyo. same procedure. PWEDE KANG MA-TRACK KUNG NASAAN KA GAMIT ANG RFID SA IYONG SASAKYAN. HINDI MAWAWALA ANG MGA KOLORUM GAMIT ANG R.F.I.D. Ang bottom line. WALANG PAKINABANG ANG CAR OWNER SA RFID, O MAGING ANG LTO. SIMPLE LANG ANG PURPOSE NITO: ISANG MONEY MAKING SCHEME ANG R.F.I.D DAHIL GENERALLY, NA SURMISE NAMIN NA ANG MGA OWNER NG VEHICLE AY WALANG PAKIALAM SA KANILANG BINABAYARAN DAHIL MAY PERA SILA, AT HANDANG MAGBAYAD KAHIT ANONG SABIHIN NAMIN BASTA HINDI NILA NAIINTINDIHAN TULAD NG R.F.I.D. HANAPAN NINYO ANG STRADCOM NG PROJECT STUDY, COMMUNICATION DOCUMENTS, SYSTEMS STUDY, SYSTEM DOCUMENTATION, IMPLEMENTATION PLANS, APPROVAL NG NATIONAL COMPUTER CENTER, AT MAGING KRITIKAL KAYO SA DATES DAHIL SINISUMULAN [A LANG NILANG GAWIN ANG MGA ITO. AT ILALABAN NILA ITO NG DIKDIKAN, MAGHABOL NA KAYO SA KORTE IKA NGA NILA. NAGSIMULA NA SILA NG COMMERCIAL SA TV DAHIL SA TINDI NG OPPOSITION DITO. KAILANGAN NILANG ILUTANG ANG STRADCOM. BAKIT SUMUGAL ANG STRADCOM AT INEXPOSE ANG KANILANG TAHIMIK NA OPERATION EH KUMIKITA NA NGA SILA NG WALANG INGAY? DAHIL SA 2.8 BILLION NA KIKITAIN SA PROYEKTO SA LOOB LANG NG ISANG TAON AT DAHIL SA PRESSURE SA TAAS NA I-IMPLEMENT NA ITO, PARA MAKUHA NA ANG PATONG. Sabi nga ng ABS-CBN, AKO ANG SIMULA. Makialam tayo. Pigilin natin ang pagpapatupad nito. I-forward sa lahat ng kaibigan niyong may saksakyan at sana ay makarating sa inyong mga kongresista, sa mga senador, sa mga taga DOTC, taga LTO, at sa malacañang. There are generally three types of RFID tags: active RFID tags, which contain a battery and can transmit signals autonomously, passive RFID tags, which have no battery and require an external source to provoke signal transmission and battery assisted passive (BAP) which require an external source to wake up but have significant higher forward link capability providing great read range. Picture here of snow in the northern hemisphere, January 1980 vs. January 2010 or 30 years apart. Below are some of the news reports about global cooling. In Florida alone, here are some news reports. HOLLYWOOD, Fla. -- Record lows across South Florida are literally freezing the invasive iguana in its tracks. Kamikaze iguanas, plummeting from their treetop perches, have long been a Floridian urban legend. On Wednesday morning, Local 10 caught the free-falling lizard on tape. The FWC Fish Kill Hotline has received several reports of cold-related fish kills over the past few days. Extended periods of unusually cold weather can kill fish outright by cold stress or make fish more susceptible to disease. WEST PALM BEACH--Rodents are trying to flee the cold and they are looking at your home as a nice place to stay warm during our freezing temperatures. In Tampa, rats have infested an apartment building there. Among the multitude of problems caused by the heavy snow fall in Jutland, has been the collapse of a pig sty roof, trapping 800 pigs beneath it. Cold wave claimed 157 lives across north India even as its intensity slightly abated today after the sun came out lifting the fog and raising temperature in parts of Punjab, Haryana and Chandigarh. In another discussion list, I asked a friend who mentioned his Filipino scientist friend who used to work for IPCC, to produce a chart, even just one chart, comparing IPCC temperature projections, say from 1990 or 2000 to 2009, vs. actual global temperatures, on those years. He did not reply. I bet IPCC scientists and writers cannot produce such chart. Because their predictions say "rising temperature" when actual temps are falling. It is very basic scientific ethics: theory and data must conform with each other. If they contradict, theory must give way, data must prevail. And such "theory" must be abdicated and thrown away, go back to being a hypothesis, to be subjected to a battery of further tests. But AGW is not a theory. It is a cult, a dogma. Even if data results contradict it, people still believe it. that's why it's a cult. Another friend asked, "With global cooling, what can we do about it?" Simple: get the most stable, most reliable, and cheapest power and electricity sources for heating and prepare for even worse cooling in the coming years. Al Gore and other climate liars remain liars. They say, "kill coal, natural gas, petrol, other energy sources that emit CO2, and prepare for more warming." Earlier, there was cat flu (SARS), then FMD (cow flu? ), then bird flu, and recently, swine flu. Now, what is this "caprine contagion", goat flu? New diseases are emerging. Or new strains from old diseases are evolving. Some of those diseases come from the tropics, others come from the frigid regions. For diseases affecting farm animals -- those that humans eat like chicken, cattle and pork, or those that humans derive some products like goat milk or cow milk -- and later become diseases affecting humans, there are at least two lines of defense: treat the affected animals, and treat the affected humans. Since the former (treat the affected animals) is seldom done, what is usually done is mass slaughter of those infected or suspected to be infected by the new dangerous disease. But killing tens of thousands of goats, like this case in the Netherlands, is very costly, both financially and emotionally. I talked to a new friend working in a multinational pharma company. Although the main concern for them is continued, and perhaps expanded, price control of their most popular, most saleable (because these are effective) drugs, the next concern they are watching is possible government price control of pharma and biotech products for crops and animals. As more and new diseases are emerging or re-emerging, the need for continuing science and medicine innovation should be recognized and hence, be encouraged, not discouraged. Below is the news story. A dangerous Dutch epidemic: goats now, humans next? EVEN for one of Europe’s most efficient countries, it is a tricky problem. At least 40,000 pregnant goats must be destroyed in the coming weeks to head off a new outbreak of Q-fever, a nasty disease that has killed six of the 2,300 people in the Netherlands who caught it last year. The culprit, Coxiella burnetii, is one of the most infectious bugs around. Released into the air during birthing or miscarriages by infected goats, a single bacterium is enough to infect a human, causing symptoms much like flu, though more persistent. Though treatable with antibiotics, it can cause fatal complications if undiagnosed. Governments have investigated it as a potential biological weapon. I heard last week about DOH Sec. Francisco Duque's planned move to the Civil Service Commission (CSC). Now it's final, and DSWD Secretary Esperanza Cabral will take his place at the DOH. The CSC is a Constitutional body. Like the Commission on Elections (Comelec), Commission on Audit (COA). The heads of those Commissions have fixed term, about 6 years. They cannot be removed by the next President, unlike a Cabinet Secretary. Heads of those constitutional bodies can only be removed by impeachment in Congress, I think. So Sec. Duque and soon, CSC Commissioner Duque, will be assured of an extended government post for the next 6 years. “It’s my first time (to be with the CSC). I haven’t even been to the office yet. I’m still trying to find out what programs to continue, what are the problems, the challenges. I’m in the process of learning,” Duque said. What??? The prime government agency to minimize, if not control, political appointees who have little or zero knowledge about the agency that they will head -- but appointed nonetheless simply because they are very close to the President or other top government officials -- is to be headed by someone who himself is not familiar with the CSC. Back to the DOH. In terms of medical and professional training, I think Sec. Cabral is less (or non-) politician than Duque. The drug price control was facilitated by Sec. Duque himself because he wanted to run as a Senator, but backed out later -- along with Sec. Jesli Lapus of DepEd, other cabinet secretaries -- when they realized that their chance of winning the Senatorial election is next to an average grade schooler's chance of passing an exam in calculus. Sec. Cabral is a cardiologist and pharmacologist. Well, that was before she accepted the work of a top bureaucrat in some agencies (DSWD, then DOH). As a pharmacologist, she will understand better the science and medical implication of discouraging innovator drugs, more disease-killer drugs but sold "high", from coming into the country with persistent ugly policies like price control. But then again, it is election time and Sec. Cabral is just an appointee of President Gloria. Between her being a physician and the political pressures of the election and weak chance of all administration party candidates, from Senatorial to Presidential, the pressure to extend, if not expand, drug price control may be heavy for her. The pharma industry -- both multinational and domestic pharma companies -- can perhaps explain to her the long-term implications of continued price control. Like the number of personnel that were laid off as a result of mandatory and coercively-imposed drug price cut. Posting here three short papers I wrote about the subject. I side with Dr. Villegas here. International trade already happened even before the Philippine State was formed, even before the Spaniards came. At that time, what was the population of the entire archipelago, half million? "Hey, do your work well, there is a super-huge market out there around the world where you can bring your products. There is also a super-huge number of suppliers of cheaper raw materials and machineries that you need to improve your productivity." "Hey, no need to improve the quality of your products, no need to innovate much, you got no competitors. We in government will protect you from external competition. Let the poor Filipino consumers endure your products, no matter how lousy and how expensive they are, consumers have no other options anyway, unless they go abroad and buy those stuff themselves." Free trade rocks! And it's one of the best news stories to start 2010. The other 4 member-countries of the ASEAN -- Vietnam, Cambodia, Laos, Myanmar -- will enjoy zero tariff for their exports to any of the 6 countries mentioned, but their imports from those 6 neighbor countries will still be subject to some minimal tariff, about 3 percent on average, until 2015. By 2016, the entire ASEAN will have zero tariff for all 10 member-countries. This is one of those very rare occasions that we have to congratulate our respective governments in Asia. Although in the case of Singapore, it's been conducting bilateral free trade agreement (FTA) with so many countries. In which case, HK is still a more free marketer economy because it simply adopted the unilateral trade liberalization policy. Zero conditionality, zero FTA negotiations with any other country, big savings in otherwise hiring expensive "trade negotiators". This is an interesting chart. The share of total exports by the US, Germany and Japan are slowly declining, that of China's is increasing at a fast pace. It was 10 percent of total world exports, vs. the US' 8 percent and Germany's 9 percent. With the ASEAN-China FTA and ASEAN being a big market with 700+ million combined population (about the combined population of the US + EU15), China's share of global exports will keep rising. The way the US is making it more bureaucratic (against terror threats), if not more protectionist, its foreign trade will be adversely affected, if not be adversely affected. Note that the significant decline in US' global exports share happened almost simultaneously with the 9/11 attacks and the high-profile anti-terror procedures of the US. weak solar geomagnetic field --> more galactic cosmic rays (GCRs) entering the solar system and the EArth's atmosphere --> more clouds formed --> less sunlight enters the planet surface --> global cooling. I heard from some friends in my alma mater, the University of the Philippines (UP), that there is a plan to offer a course in Law and Economics that will be co-taught by both the UP School of Economics (UPSE) and the UP College of Law. I believe this is a good and bright move. Law and economics. Rule of law + proper allocation of limited resources. I suggested to them an unsolicited opinion. That one of the focus of the subject should be on property rights. Both physical property and intellectual (or non-tangible) property. Property rights is the cornerstone of a free society. For instance, remove or garble the security of your property rights to your car, then other people can say, "Your car is also my car, so I can open and drive it anytime I want". Extend such absence of exclusive property to your house, your cell phone, your land, etc., and you will have zero peace of mind. It's the same with invention and intellectual property rights (IPR) for certain patents like a new medicine or new vaccine. The current Cheaper medicines law allows compulsory licensing (CL) in cases of national health emergencies as determined by the DOH Secretary. While there are safeguards against its abuse, this provision nonetheless would allow, if not encourage, some local or non-innovator pharma companies to say, "The cost of your expensive R&D, the losses to your unsuccessful drugs are yours and yours alone. But your successful, blockbuster and highly saleable drug invention is also my invention." Then we can see the impact on the economy. Certain studies have shown that countries that promulgate the rule of law and private property rights have more developed economies. While countries that make a mockery of the rule of law and private property rights are underdeveloped. See for instance, www.internationalpropertyrightsindex.org. That's law and economics. That should be an exciting subject in the future in both prestigious colleges in UP. This chart is from www.drroyspencer.com. The numbers for this chart are also indicated in that site. 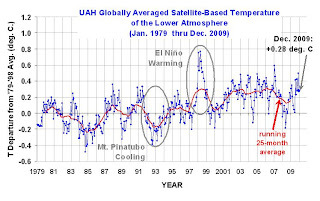 This is the global temperature anomaly for 2009 compared to average global temperature from 1979 to '98. 1. Global temp. anomaly for Dec. 2009 was only 0.28 C.
For the whole 12 months of 2009, temp. anomaly was only 0.26 C.
2. NO global warming happened after 1998. All 11 out of 11 years (99 to 09) were lower than 1998 temp. Despite the fact that CO2 concentration in the atmosphere keeps rising. The IPCC received research inputs from more than 2,500 scientists around the world, but only a few wrote the assessment report. And some of those few scientists were caught in the "climategate" emails to to have manipulated and falsified climate data to "prove" AGW. AGW is like Y2K and UFOs. Myth and hoax. The above chart also shows that Mt. Pinatubo eruption did not result in warming but COOLING of the world, by about 0.5C for nearly 3 years. Mt. Pinatubo's dust, ashes and gases covered the Earth's atmosphere that sunlight could hardly penetrate the Earth's surface and ocean, resulting in cooling. The earlier warming, from about 1850 to 1998, was a result of natural climate cycle (what is now bastardized as "man-made climate change/global warming"). The Earth plunged into a little ice age (LIA) of global cooling for nearly 400 years, from 1400 to 1800, especially during the "Maundeer Minimum" and "Daton Minimum". Prior to that, the Earth baked for almost 600 yrs of global warming, during the Medieval Warm Period (MWP), a period much warmer than the recent warming. 2. Current warming is "unequivocal" and unstoppable, we can only mitigate the level of warming. 3. CO2 is an evil gas mainly responsible for warming. So don't breath in front of your spouse and children, you might poison them. Climate change or climate cycle is natural, it's never man-made or caused. There were periods of global warming-cooling- warming-cooling in the past. Why? Because there are a dozen plus of factors that affect the earth's climate -- the Sun, galactic cosmic rays, volcanoes, aerosols, biosols, Pacific decadal oscilation (PDO), atlantic oscillation, water vapor, clouds, the ocean, Earth's revolution around the Sun, etc. It is important that we seek the truth, to prove who is WRONG and who are the LIARS. Who are the liars? It's clear -- UN IPCC, Al Gore, the big environmentalist groups like Greenpeace and WWF, almost all governments that want more carbon taxes, more environmental regulations, more carbon tariff, more climate bureaucracies, more ecological central planning. That is why in the language of the above group, all the factors that I mentioned above that contribute to the Earth's climate are "secondary or insignificant" factors. For them, there is only ONE major cause, and that is CO2. And our modernization, our cars, our malls, our big buildings, our huge electricity consumption being logged online often, etc., is destroying the planet. Sorry for the strong language but I have little or no respect whatsoever to those leaders of the warming scam. More than 31,000 American scientists signed the "Petition Project" initiated by Dr. Richard Lindzen. I have a hard copy of that list. Those are 31,000+ American scientists only, don't include Canadian, European, other scientists, who declared that "man-made warming is wrong, that CO2 is not harmful to human", etc. The gas that we exhale is not soot or methane or lead or what have you. It is CO2. If CO2 is harmful, then we should not talk and breath close to other people, say our spouses, because we might poison them with the "evil" gas that we exhale everytime we breath. On this alone, we can see the lies and evil being spread by the top warmers like Al Gore and the IPCC. The vaunted "IPCC transparency" is a joke. here are 2 of the many reports (a bit long). November 20th, 2009 by Roy W. Spencer, Ph. D.
The recent hacking of the University of East Anglia’s Climatic Research Unit (CRU) computer system has led to the release of hundreds, if not thousands, of e-mails which — if real — reveal the tactics and motivations of some of the top Intergovernmental Panel on Climate Change (IPCC) scientists. In this article, reprinted from The American Thinker, two eminent Professors reveal just one of the many seamy stories that emerge from the Climategate emails. A prejudiced journal editor conspires with senior IPCC scientists to delay and discredit a paper by four distinguished scientists demonstrating that a central part of the IPCC’s scientific argument is erroneous. IPCC global temperature projections, say from 2000 to 2009, vs. actual global temperatures on those years. Get the most sophisticated computer climate models in the world, whether by NASA or NOAA or UK Met or whatever government. Then ask them to predict with full confidence, the weather and temperature range in their country or of the world for the next week or next month. Can they make such prediction with full confidence? I really doubt it. If they cannot predict the weather and temperature range in the next 10 days, and their models in 2000 failed to predict the actual temperatures in thhis decade, why have we been fooled that their computer models can predict the climate and global temperature 100 years from now?